Today, June 21st, is National Aboriginal Day in Canada and summer solstice. On the longest day of the year, Canadians can recognize the contributions of First Nations, Inuit and Métis people to our national culture. In 1996, the then Governor General of Canada, Roméo LeBlanc, first proclaimed National Aboriginal Day. The decision to honour Indigenous peoples on summer solstice was because many aboriginal cultures in Canada and around the world celebrate the day. The proclamation followed the request for the national holiday by the Sacred Assembly, a Canadian conference of Indigenous and non-Indigenous people chaired by Elijah Harper. This was more than decade after the National Indian Brotherhood (now called the Assembly of First Nations) called for National Aboriginal Solidarity Day. Mary's Point, NB, near twilight on a long summer day. Mary's Point was named after a Mi'kmaq girl. Read the whole story here. What does this mean to the people of Albert County, New Brunswick? For millennia, Mi'kmaq have lived in Albert County. 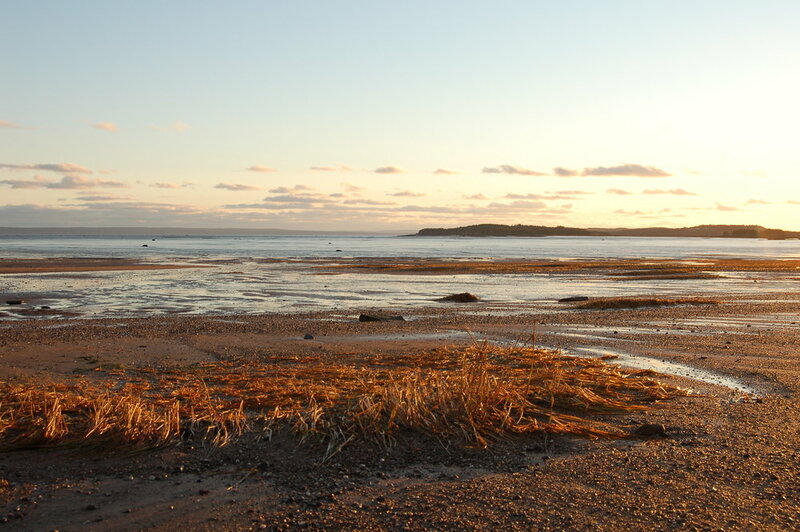 Traditionally, Mi'kmaq people lived by the coastline in the summer where they fished, dug clams, picked berries and wild greens, such as goosetongue and samphire greens. In the fall, they moved inland and survived by hunting larger mammals. In the 1700s, Acadians and Mi’kmaq lived in Albert County. After the Acadian expulsion by the British in 1755, many Mi’kmaq, who were allies of Acadians, also left. Later, a small number of Mi’kmaq and Acadians returned to the area. In the last few centuries, Mi'kmaq lived in communities throughout Albert County. Some of the men worked in the logging camps or trapped and hunted during the winter. In the summers and later as a permanent move, many left Albert County and moved to Fort Folly, a community that became a reserve in 1840. People in Albert County today may remember people from Fort Folly selling baskets made of ash bark or bouquets of mayflowers back in the 1940s and 1950s. Members of Fort Folly First Nation play an active role in Albert County now. At Fundy National Park and along the Petitcodiac River watershed, Fort Folly is an active participant in ecological surveys and conservation. Today is a day to celebrate and honour the First Nations in Albert County and throughout Canada. It is also a time to reflect on the lessons of the past and strive for a better future.